I’ve haunted by Hollywood lately. Or to be specific, hack Hollywood writers. This week marks the third film I’ve seen this year where ghostly daughters visit their grieving fathers. First there was Creation where the adorable Annie Darwin caused her Papa (Charles Darwin) to be reduced to tears, chasing a phantom across his estate. Then there was Mad Mel Gibson playing a bereaved father on mission of revenge in Edge of Darkness. As Thomas Craven, he can shed blood with the best of them, but he’s not above calling out for Emma, his recently dispatched daughter. And while the movie is aiming for Dirty Harry status, the Hallmark Card ending with father and daughter arm in arm would make the hard-boiled hero want to swallow his Magnum. 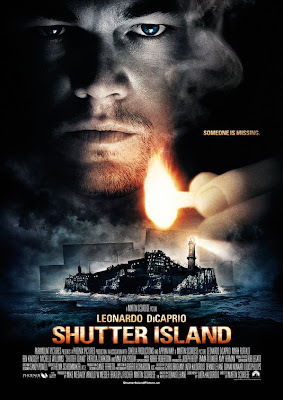 Which bring us to today and Martin Scorsese’s pretzel-plotted thriller Shutter Island. Here we see US Federal Marshall Teddy Daniels visited by not just his daughter, but also his dead wife. As Teddy, Leonardo DiCarprio copes as best as he ca n with these chalk-coloured phantoms, but there’s a fine line between ghoulish visions and The Ghost Whisper. So Hollywood hear my plea. Enough with the ghost writing already. Surely you can find another way to show the father’s grief. I know “Show Don’t Tell” is screenwriting 101. But some things are better implied than described.